Description : Here we have an official 'Tecate' fight sponsors closed circuit poster for the showdown at the MGM Grand Las Vegas for the WBC Super/Welterweight Title. 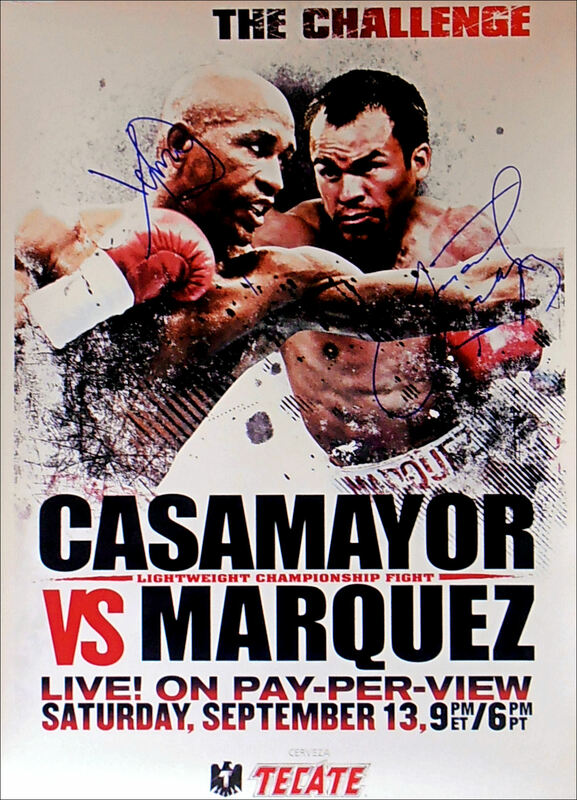 This poster was signed by Marquez & Casamajor at the MGM Grand pre-fight presser. Juan Manuel Marquez vs. Joel Casamayor was a boxing lightweight super-fight. In 2008 reigning lightweight Champion “El Cepillo” Casamayor met former two-division World Champion Juan Manuel Dinamita Márquez at the MGM Grand Garden Arena in Las Vegas for a 12-round championship bout. Casamayor was the champion of boxing's lightweight division, recognized as the title holder by Ring Magazine, even though he didn't own any of the belts from boxing's four major sanctioning bodies. Márquez defeated Casamayor in the 11th round after two knockdowns, and captured his sixth world title in three different weight classes. Two minutes into the eleventh round, Casamayor was knocked down by a right punch as he pulled away from an intense exchange. Casamayor was able to get on his feet, but it was clear he was still shakey from the knockdown. As soon as the action was allowed to resume, Márquez went in for the kill as he let his punches go in furious combination. Casamayor punched back, but he was knocked down again with about 7 seconds left in the round. Referee Tony Weeks stepped and stopped the bout, as he deemed Casamyor unable to continue. The official judges had the fight scored 95-95, 95-95, and 97-93 for Márquez before the 11th round knockout. After the win, Ring magazine ranked Márquez second on its pound for pound list, and rated him as the lightweight champion. These official fight sponsors posters are not made available for public consumption & can only be sourced from a participating PPV outlet or at the event weigh-in! Hence the scarcity as once the televised event if over, then these posters go straight to skip. 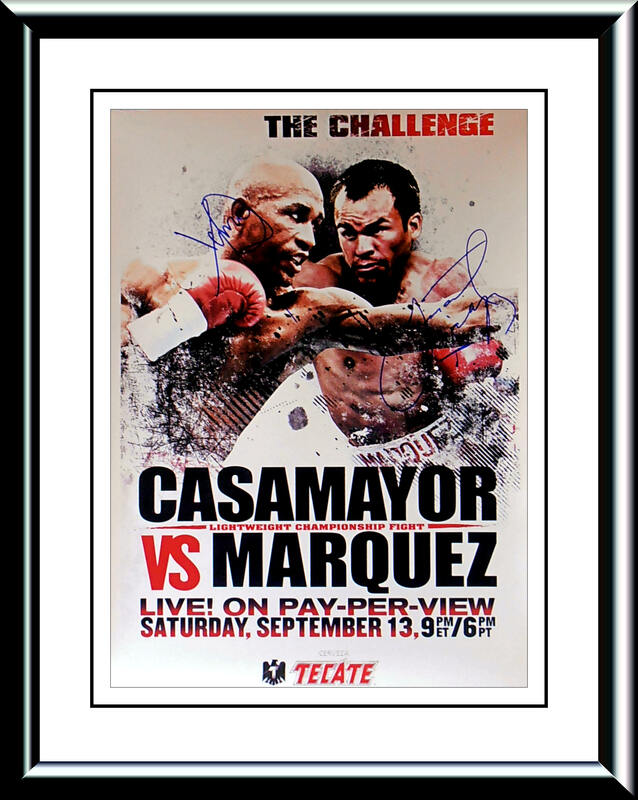 This Juan Manuel Marquez & Joel Casamajor authentic autographed Tecate fight sponsors closed circuit poster comes with a letter of guarantee of authenticity from KOfightposters.com for a lifetime & beyond. Condition : Excellent/minor handling wear/framed 4 display purposes only!